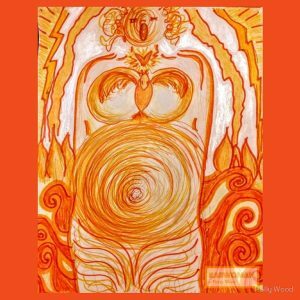 Joining us today is Polly Wood, of Polly Wood ~ Placenta Encapsulation Services. Many people deliver their babies in a hospital setting, which leads to some questions when it comes time to prepare the placenta. At PBi, we train our Placenta Encapsulation Specialists® to go to the home of the birthing parent to prepare the placenta right there, in their own home. Hi! Welcome to another episode of Ask The Placenta Lady, where no question is too strange for The Placenta Lady. 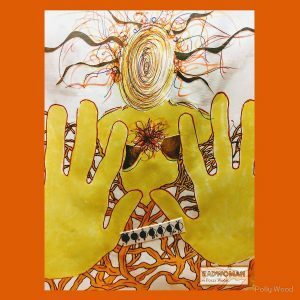 My name is Jodi – I started working with new moms back in 2006 and all of my clients just started calling me The Placenta Lady, so that’s what I go by. I’ve literally heard every question related to birth, pregnancy, postpartum, so that’s why our tagline is, “No question is too strange for The Placenta Lady” – because we’ve literally been asked everything. 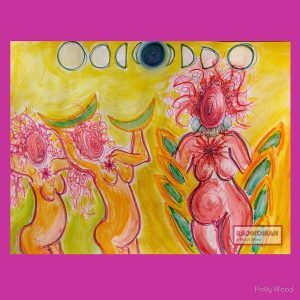 I am very excited to have one of our Placenta Encapsulation Specialists® from upstate New York joining us today, and her name is Polly Wood. Welcome to the show, Polly. [Polly]: Thanks so much for having me, I’m really happy to be here. I’m excited to talk to y’all about my experience as a PBi Placenta Encapsulation Specialist®. [Jodi]: Welcome to the show, Polly. Why don’t you tell us a little bit about your work and what you do out there in New York? [Polly]: Thanks, Jodi. So, I currently live in upstate New York. 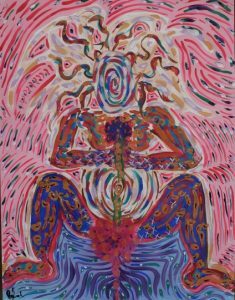 As of this year, I’ve been doing birth work of all sorts for 20 years. In 1998 I became a birth doula out on the west coast. I did birth assisting, I was taken by a lot of creative energy around birth. Some of my artwork you can see behind me is inspired by birth, and pregnancy, and women’s power in general. 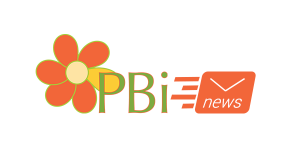 I started training with PBi in 2009 or 2010, so I think I’m moving into my eighth year of working within the PBi network offering placenta encapsulation and postpartum support. And that’s really what I’ve been focused on for the last seven or eight years. Although I love pregnancy and birth, I feel like in general the postpartum period kind of lacks in our culture as far as the amount of support that’s available. [Jodi]: That’s awesome, Polly. I love that more and more women are getting into the postpartum care and support and that women are getting more of that care and support once they have had their baby. So, thank you for contributing to that. That is a great question and one that we actually get a lot. With PBi, with my training organization, I had to work with a lot of safety agencies and oversight committees and things like this. I am located in Las Vegas, Nevada, so here the Southern Nevada Health District (SNHD) regulates such things. Federally, we have the Department of Transportation (DOT). Each state also has their own regulations, but there are a lot of protocols and safety and licensing and things that come with the transport of human organs. So as a leader of an organization that does training and certification we decided that it was safest, both for mothers and for placenta preparers, to have the parents transport the placenta home from the hospital. And that just eases everybody’s mind. The parents always have control of the placenta, they know how it’s being handled, they know the whole chain of custody as far as getting it home from the hospital. It never leaves their jurisdiction, their oversight. If you have your baby at the hospital then you would have a cooler [to transport the placenta home]. It has to have the rigid sides and it has to be able to snap completely and securely closed. You would then be given the placenta at the hospital and you would then take it to your home. At that point, you would either keep it frozen for your specialist or you would start the thawing process. And of course at that point you will be in touch with your placenta preparation person. [The US] only has three states in our country that legally protects the parent’s right to take the placenta home from the hospital. At the hospital, they will often just secure the placenta in the different kind of packaging that they use, and a lot of times they will place it in a freezer. Now, different hospitals in different states have different policies regarding the release of placentas. Here in Las Vegas, it’s all up to the different hospitals and they can create their own policies. We currently, as of this filming, only have three states in our country that actually legally protects the parent’s right to take the placenta home from the hospital. So, what that means is that every hospital just has their own policy and procedure. This also means that you just need to talk to them in advance and say, “hey, I plan to take my placenta home, what do I need to be aware of to make that happen?”. There’s no law forbidding your release of the placenta. You can absolutely, legally take it home, it’s just hospital policy. 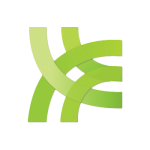 If you run into trouble, please reach out to us as an organization, PlacentaBenefits.info. We can help you in your state or in your province, to see what we can do to help and advocate on your behalf with the hospital if they would try to refuse [your request to release the placenta]. So, it’s not a legal precedent, it’s literally just hospital policy. So just be aware of that, there’s no law forbidding your release of the placenta. You can absolutely, legally take it home, it’s just the hospital’s policy. So, we can change those, or try. Or, since you have choices in childbirth. you can choose to deliver at a hospital that has a more mother- and placenta-friendly release policy, so it is your option. Please, feel free to exercise those and please feel free to reach out to us at PBi. All of us would be more than willing to help you with that situation. We come to you and we do everything right there in your own home, under your own oversight. So once you get the placenta home, then we would arrange with your Specialist to come over and get started, and that’s based on your convenience and the availability of the Specialist. And again, we never transport, we never take it anywhere. We come to you and we do everything right there in your own home, under your own oversight. Do you have anything that you would like to add, Polly? [Polly]: I have a lot to add to this. I love hearing so clearly the piece about safety, transport standards. Here, in the area where I live, generally it’s really easy. I’ve never had any challenges with our local hospital. Actually, a lot of the nurses and midwives, and doctors, at the local hospital are very encouraging. Sometimes I hear from someone that they’re in the hospital – this would be Cayuga Medical Center in Ithica, New York – and if they don’t have plans for their placenta sometimes I will hear later that one of the nurses asks, “Oh, are you going to take your placenta home?” So, that’s often a surprise. I actually do a fair amount of traveling outside of the Ithica area. I travel to Corning, Binghampton, Elmira. A couple weeks ago, I traveled over the border a couple hours into Pennsylvania. I think that when people do the research, they find out that they really want someone who’s been trained, and they want to work within the PBi network, and they like this idea of having someone come into their home, they will find someone to travel and that’s often me within this whole upstate New York region. So, besides the safety standards, I do often get the question when people reach out, “I’m interested in having my placenta encapsulated, how does that work for them to come into my home?” There’s something that happens – I think it’s probably very different for all of us based on what type of experience we bring to the new mom and her family – but I feel like there’s a bit of shapeshifting that happens with every individual client. Just as every birth is unique, every placenta encapsulation experience is unique. Just as every birth is unique, every placenta encapsulation experience is unique. It’s really an honor when a family lets me come into their home and work with them in that really special, sacred, intimate first couple of days. So, usually I end up getting there within the first 48 hours of postpartum. The situations vary from times where someone is held in the hospital a little bit longer, whether they need extra healing or they’ve had a Cesarean birth. Sometimes I end up going to the parents’ home and preparing the placenta while they’re not there and I’m just in very close touch, phone and text. And then the other extreme is where I get to their house and the grandparents are there, and the in-laws are there, their family, their best friends, the other little siblings, and it’s a family affair. It’s really based on the needs of the mom and the comfort level of the moms. Really, what I learned as a doula is that each situation, each home, each placenta and family is different in that it’s really based on the needs of the mom and the comfort level of the moms. So, if I come into your home and you’re interested in the process and you want to see the placenta and you want to help make the prints, and you want to take photographs, and you want to see every step of the way, then you are absolutely more than involved in that. If you are quiet, and tired, and sleepy and you just want to stay and nurse your baby in the other room, I feel like I can either be engaged with people in their kitchen or I can sort of do what a doula does, which is sort of be invisible even though I’m taking up a lot of space and working in the kitchen. I feel like the placenta encapsulation that happens in the home really helps integrate the complete holistic birth experience. So, it really becomes an educational experience for those that are really interested in it, and I feel like the placenta encapsulation that happens in the home really helps integrate the complete holistic birth experience. Because whether you had a home birth or whether you had a hospital birth, you just really never know how it’s going to go, and once the baby is there there’s a flurry adrenaline, there’s a flurry of activity, and I feel there’s a kind of a magical support that we offer by being in the home and being yet another encouraging, calming, normalizing voice. Sometimes new moms, they get sent home from the hospital, it’s their first time, and all of a sudden they’re alone, or they’re alone with their partner, and they’re like “is this how it’s supposed to be?” So to have yet another person actually come into their home, because not everyone has family support, not everyone has community support. So besides just doing the encapsulation, which is the main service, I feel like I tend to bring a bag of tricks. If moms are receptive I use them, if they don’t want them, I don’t push anything. But I just like to be another person that’s there to say, “hey, if you need something I have 20 years of experience, this is what I see all the time”. So, yeah, besides the fact that most people say they’ve never seen their kitchen so clean when I leave, which is kind of a common PBi promotional experience, it’s true. A lot of feedback I get is that they had no idea how cool the placenta was. And what an awesome experience it is to be able to see the whole process from start to finish. Or even if a couple, or if mom is still in the hospital, I will ask her and will take photographs. I go through lots and lots and lots of rubber gloves while I’m there to keep sanitary, but I will take photographs and texts along the way so she is able to still feel like she is part of the process if she wants to be. [Jodi]: That’s all really awesome, Polly, and I know as just the PBi trainer it’s been awesome having you as a part of our community, for pretty much the last decade or so. Which has been fantastic. I just wanted to add on to a couple of things that you mentioned. I loved how you said that by coming into the home we kind of end up becoming another normalizing person for her. Especially if you haven’t had a baby before, and if you are just getting home from the hospital, it can feel a little bit overwhelming. And I know that for myself, personally, I’ve been doing this a pretty long time and just like I say, there’s no question that’s too strange for The Placenta Lady. Literally, we’ll get all kinds of questions and it’s nice to have somebody that you can kind of build this relationship with and there as a support person for you. And I know that with my clients, even weeks or sometimes months or sometimes years, I’ll get a text, “Hey, this just happened, what’s up with this?”. It’s really a blessing and an honor to be invited to participate in their postpartum recovery in that way, whatever that looks like for them. And just building that sense of community, because really we do need all the support that we can get in those early days. And it’s just so helpful to have somebody there to answer your questions. And I know that when I come in I absolutely cater to my families. It’s literally whatever they want and whatever their comfort level is. Sometimes we do come and mom just stays upstairs with the baby and I’m left pretty much to my own devices there in the kitchen, and then sometimes I have three and four generations there in the kitchen asking questions and taking pictures, and aunts and uncles, and it almost is like a little postpartum party. And it’s really a blessing and an honor to be invited to participate in their postpartum recovery in that way, and whatever that looks like for them. It goes far beyond just preparing the placenta and I think that that’s something that I really want women to know ~ We are there in the community to provide support – even if that just means a listening ear. So, it really is a great way to connect and to build that relationship. And then we can also see how mama is doing. What kind of support does she have? Are people offering her water? Are they bringing her food? Or is she kind of left to her own devices? And so, we can sometimes then lend additional support, maybe reach out to other people in the community. May suggest lactation consultants, maybe suggest postpartum doula, suggest ways to kind of ease this transition for her. And it goes far beyond just preparing the placenta and I think that that’s something that I really want women to know, is that we are there in the community to provide a variety of just plain support and even if that just means a listening ear. Did you have anything that you would like to add to that at this point, Polly? Sometimes people don’t really know how to find the support they need. [Polly]: Yeah, so there’s a lot of staying in touch that I think lends to the overall postpartum wellness of a new mom or someone who’s just a baby, whether it’s their first time or not. Personally, I let the moms know this when I’m ready to leave their house and they have their capsules. I let them know that I text a lot in the first couple of days, in the first couple of weeks, and then slowly it tapers off or I lose track of time. Because we have really specific dosage suggestions and guidelines that we follow and because the moms are tired and overwhelmed and it’s a lot of information, I tell them that I’m going to text them reminders. End of the first day, after a couple of days, when the dosage changes. And I always say, you don’t have to text me back, you don’t have to respond, I want you to know that I’m just giving you these reminders. So a lot of times that will start an ongoing sort of support for the first few weeks or couple of months and I’ll just check back in. I think they usually just appreciate having someone else to check in. And again, as you said Jodi, if we’ve met a partner, if we’ve met a child, and we know a little bit about their family we can also check in about that. And often, suggest links to other specialists in town or in their community, or hey, have you asked your friends to set up a meal train? There’s sometimes things that come natural to us when we’ve been in birth work that sometimes people don’t really know how to find the support they need. [Jodi]: So you just mentioned pick up, drop off and I just wanted to kind of clarify that. In the placenta preparation world there is a mode of practice for picking up placentas from the birth, so whether that’s at the hospital or whether that’s from the parent’s home, and then bringing it somewhere to have it prepared into capsules, and then dropping off the capsules [back to the client]. That is what that’s referring to – “the pick up, drop off method”. The pick up, drop off method. Now, I obviously am not personal fan of that. I’ve just been doing this work a really long time and I’m a little bit older and have seen a lot of things happen and kind of go awry. Like they say, best laid plans… Here in Nevada, the Southern Nevada Health District would not allow any sort of preparation of human organs for ingestion in a facility. There’s no licensing or oversight or anything that you can get in the state of Nevada that would allow that. And so, from that perspective, I operate completely within the guidelines of my state and health district and region. So that is why I personally do not pick up and drop off – pick up placentas and drop off capsules. The placenta is from your baby and it is just as unique and just as special as your baby. And it’s irreplaceable. But for the parent’s perspective, as a mother of three, the placenta is from your baby and it is just as unique and just as special as your baby. And it’s irreplaceable. So, having you carefully and lovingly transport it to your home where it remains for the duration of the preparation process where you can see how I’m handling it, where you can see the placenta, where you can see the entire process. Just having that level of transparency, I feel, is an important part of my services and an important part of what I offer my clients here in Las Vegas. And it’s also part of how I train and promote placenta encapsulation services to all of my students, all of my members, and everybody that is in the PBi organization. So, we prefer to come to you, take care of you, in your own space and then yes, leave your kitchen a whole lot cleaner than when we arrived. So, it’s just our little way of making sure moms are taken care of in those early days. Thank you so much for being on the show today, Polly. [Polly]: Thanks for having me, Jodi, it’s been great to talk with you and just talk more about how we serve new moms and their families. [Jodi]: If somebody wanted to get a hold of you or find out more about your services or maybe more about your artwork, how would they go about contacting you? [Polly]: I have a Facebook page which is specific for my placenta encapsulation, I believe it’s just called Polly Wood ~ Placenta Encapsulation Services, you can find me by Googling me that way. So as a multi-disciplinary artist I also have two websites which have some of my artwork, and music, and such on them. And one of those is Rad Woman, which is R-A-D W-O-M-A-N.com. The other is my name with a WS at the end, so it’s PollyWood.ws. And actually, just a couple of months ago I released some of my artwork onto various merchandise and that is through a site called Red Bubble. So you can look for Rad Woman images or my name on Red Bubble. So, I also of course have a profile page on the Placenta Benefits providers search engine. So, if you go to PlacentaBenefits.info and search to find a provider you can find me there. [Jodi]: An easy URL for finding another PBi Placenta Encapsulation Specialist®, if you’re not in Las Vegas for myself or if you’re not in New York for Polly, a quick URL is Placenta.directory. It’s not even placenta.com or anything like that, Placenta.directory. Of course, our main website is PlacentaBenefits.info where you can find out more about why to use your placenta for postpartum recovery. Don’t forget to subscribe to our YouTube channel so you never miss an episode and thank you for tuning in to this episode of Ask The Placenta Lady, where no question is too strange for The Placenta Lady!